"Being in public when he is in uniform and feeling like the proudest person on the planet"
As I watched him walk across the field that sunny autumn day I couldn't help but smile. He stood with me, cheered on his son, and we prepared to head home. Then one fellow soccer-mom came up to shake his hand. We didn't know her. She just wanted to say 'Thank You'. She said it to him but somehow in that moment I felt Thanked too. The Pride of the Military-Spouse is deep. The feelings are strong. The love is unflappable. I know that pride! I lived on an installation with a gazillion folk in uniform; however, when I saw my airman walking, standing, breathing... whatever I was ballooned with pride. It is true, that uniform is tops! I too feel that same sense of pride. I remember one day my hubs and I got to have lunch together and decided to go to a fast food resturant. The lady behind us tapped my husband on the shoulder and said she would like to thank him for his service by buying him lunch. He politely declined but she insisted and gave him a $20 bill. I feel pride in him and thankful ness in those that take the time to thank our brave soldiers. 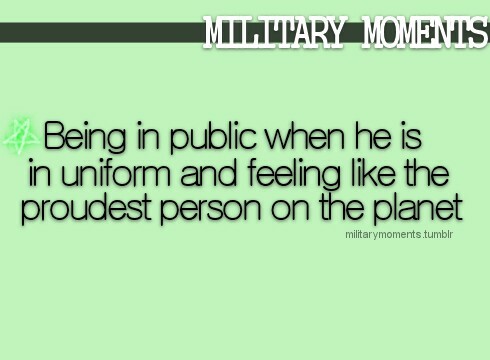 I am SO proud to be with my husband when he's wearing his uniform in public! Even if we're at Walmart and see 20 other soldiers, I am so proud because Christopher is MY soldier!